The provincial government and the Saskatoon Tribal Council have officially put a battle over child welfare behind them. 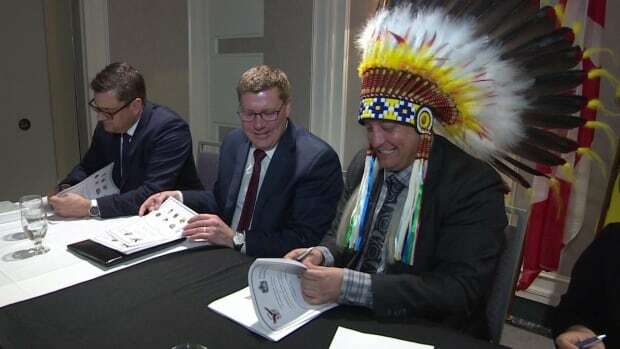 The STC signed a series of child welfare agreements with the province in Saskatoon on Friday — a new delegation agreement, and agreements titled the Children and Families Reconciliation Partnership Agreement and the First Nations Panel Protocol. The delegation agreement re-establishes the tribal council’s child and family services agency. In 2016, the province’s Ministry of Social Services announced it was taking over the tribal council’s child welfare programs after being denied access to child protection files. It led to an almost three-year legal battle between the province and the council, which represents seven member First Nations within a 200-kilometre radius of Saskatoon. Now, the STC is getting its agency back. Tribal Chief Mark Arcand said the council has a new relationship with the province. Both he and Social Services Minister Paul Merriman said a discussion over coffee over a year ago was a turning point. “The theme of that was ‘let’s put the child in the middle,'” Merriman said. “And you know what? We accept our wrongs as a Saskatoon Tribal Council,” Arcand said. Priorities in the new agreements include keeping mothers and their newborns together through better prenatal prevention and support, as well as including families in the decision-making in child protection matters. There is also a commitment to review plans for tribal council children and youth currently in care to ensure they support connections to culture, language, identity and community. “So all of this work is about prevention,” Arcand said. “It’s not about apprehension or protection. We don’t ever want to hear that word. Arcand said the provincial government “came out of its comfort zone” in signing the new agreements. “This is a big step for the province,” he said. Arcand hopes this arrangement will be a model for other First Nations, a sentiment echoed by Premier Scott Moe. “I think that would be our hope and we’ll be working towards that very, very quickly,” Moe said. Arcand said one of his immediate priorities was to see the process begin to have 100 STC First Nations children in care repatriated back to their home communities.